A young man prepares to don his tastoan mask. Santiago el Apostól (St. James the Apostle), the patron saint of Spain, was reputedly one of Jesus of Nazareth’s apostles and among the first to be martyred. He is also known as St. James the Greater (Santiago el Mayor) to distinguish him as the son of Zebedee (James the son of Alpheus was supposedly younger), and sometimes St. James the Moor-Slayer (Santiago Matamoros), based on the myth that he appeared on the battlefield some 700 years after his death to help the Spaniards repulse a Moorish attack at Clavijo–a battle that, in fact, never occurred. Nonetheless, St. James carries a reputation throughout Spain and Latin America as a Catholic conquistador. 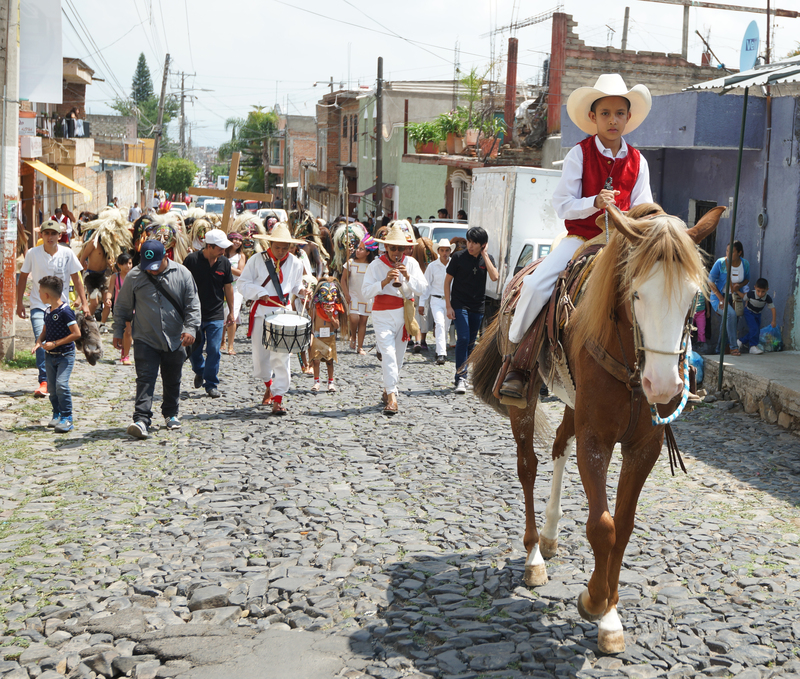 Many communities in Catholic countries treat St. James as a local patron saint, including Tonalá in Jalisco. Tonalá is a town of moderate size, located a short distance from the state capital, Guadalajara. 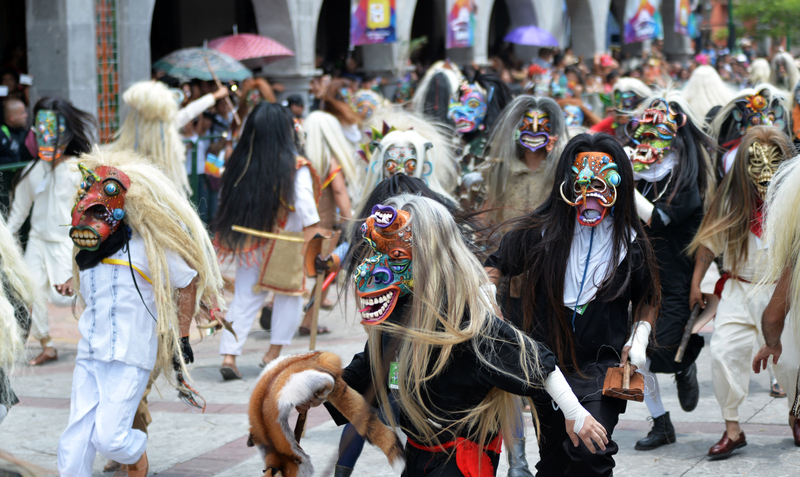 The locals are known as tonaltecos, and they recall with pride the resistance of their forbears to Spanish conquest. The conquest in Jalisco was particularly brutal, led by Nuño Beltrán de Guzmán, whose strategy was to slaughter and torture the indigenous peoples of Jalisco (called Chichimecas by the Spaniards) until they submitted to slavery and Catholicism. Despite the sturdy resistance of the Jalisco peoples, the Spaniards conquered them with the help of a large number of indigenous allies (Aztecs, Tarascans, Otomies, and others). 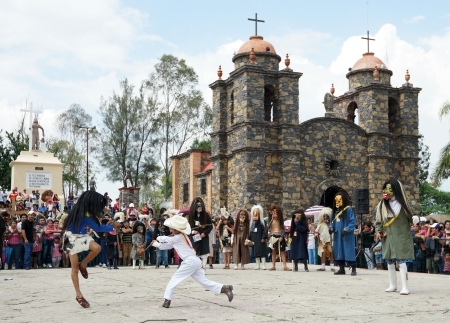 A boy representing St. James leads the tastoanes toward the battlefield, accompanied by musicians and crucifix-bearers. These events left the indigenous peoples with a highly ambivalent attitude about their colonial history. On one hand, they worship the Catholic pantheon and are grateful that the Spaniards brought their cherished religion. On the other, they feel resentment at the bloodthirstiness of the conquest, which could not possibly have been less consistent with the values Jesus taught, and pride in the strength and skill of their ancestors. 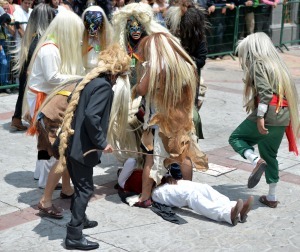 Actors representing an indigenous shaman and queen purify the arena with incense before the battle. 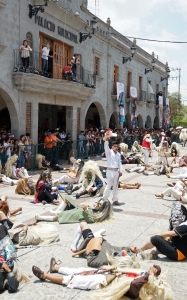 One of Tonalá’s most important holidays is the Festival of St. James (Fiesta de Santo Santiago), held annually on July 25 and lasting nearly a full week. 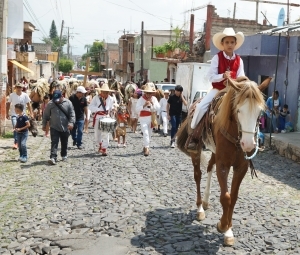 The highlights of the celebration are processions of “tastoanes” (also spelled tastuanes) led around town by an actor representing St. James himself on horseback, and accompanied by a carved image of St. James carried by the tastoanes. 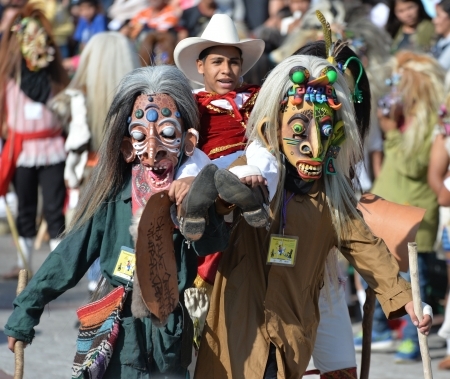 In addition, either three kings wearing clay masks or three Aztec women (one representing the Tonaltec queen Tzapotzintli, also known as Tzuapili or Cihualpilli, and another representing a shaman) carry an image of St. James along a parade route and leap and dance to the music of drums and traditional flutes. 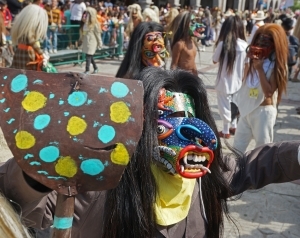 The tastoanes represent the indigenous Jaliscans. To portray them, the actors wear primitive (though sometimes protective) clothing, strong cowhide masks with fearsome expressions, and carry shields of wood and leather. A typical tastoan, displaying his leather shield. 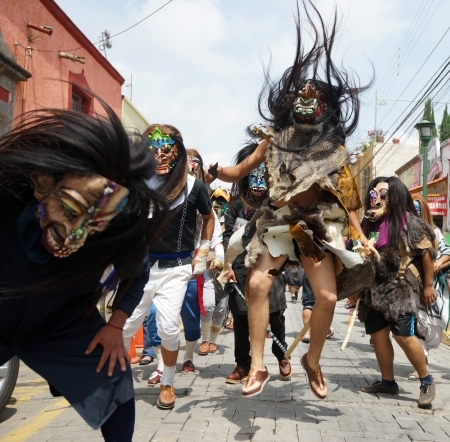 The masks are thick and heavy to protect the tastoanes from the whip blows of St. James, and are protected in the rear with a thick horsehair or ixtle fiber wig. To represent the ferocity of the Jaliscans, the mask typically has an oversized nose and mouth with tusks and fangs; spots to represent the smallpox brought by the Spaniards; and decorations in the form of spiders, snakes, scorpions, and sometimes the nahual and nahuala, mythical beings that are half jaguar and half human. 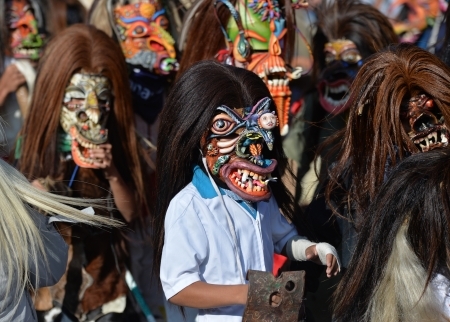 Masks may be made by the wearer or by professional mask-makers, of which there are several in Tonalá. The tastoanes swarm in to attack St. James. St. James viciously whips the tastoanes from horseback. The jugada or juego (mock battle) begins sometimes with the shaman purifying the arena with incense, and other times with worship of the image of St. James. 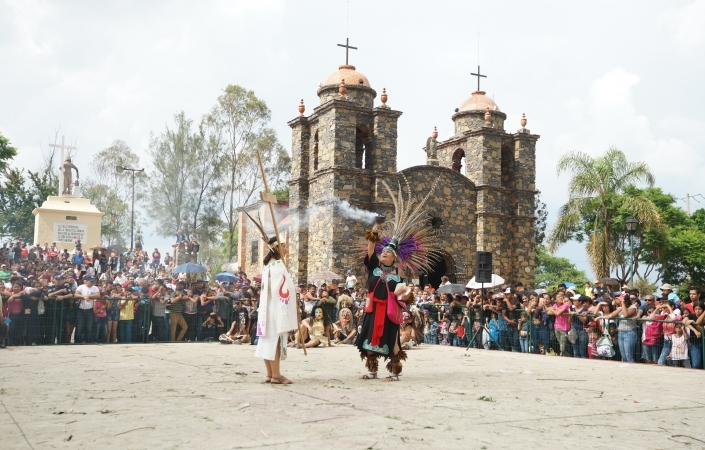 It is followed by memorized speeches from the tastoanes, who defy the Spanish invaders and proclaim their preference of death to conversion to Catholicism. St. James then rides into battle to traditional music, attacking the tastoanes with long whips made of stripped quince tree branches. Obviously, St. James himself had nothing to do with the conquest of Mexico, but he symbolically represents Spain. Throughout the battle, St. James does not hold back; he exerts himself to whip the tastoanes as hard and as often as possible. The tastoanes are not permitted to strike St. James in retaliation, but rather must display their fortitude by enduring the harsh blows or blocking them with their small shields. The whip blows frequently leave welts and gashes in the tastoanes, who sometimes end the celebration bleeding profusely or even permanently scarred. The tastoanes humiliate and torture St. James. Soon after the battle begins, the tastoanes manage to pull St. James from his horse and capture him. They carry him to the center of the plaza and torture and taunt him. Meanwhile, a masquerader dressed in a savage dog mask, representing St. James’ faithful companion, attacks the tastoanes, driving them away and reviving St. James. St. James and a tastoan face off, with St. James showing little Christian mercy. St. James then continues his fight on foot, mercilessly whipping the tastoanes until his whips break. The tastoanes may taunt and even push St. James when his back is turned, but they never attack, preferring to show their agility in dodging his whip or, for those with exceptional bravado, enduring the blows with disdain. His dog (and sometimes other tastoanes) continually supply him with new branches, until all the tastoanes have been defeated. At the end of a long battle, all of his opponents lay dead around him, and he celebrates by proclaiming the victory of Christianity. Sadly, his loyal dog does not survive the battle. St. James reigns victorious, celebrating the slaughter in a most unchristian manner. The Fiesta de Sto. Santiago has become so large that it occurs in different parts of town several times each day. 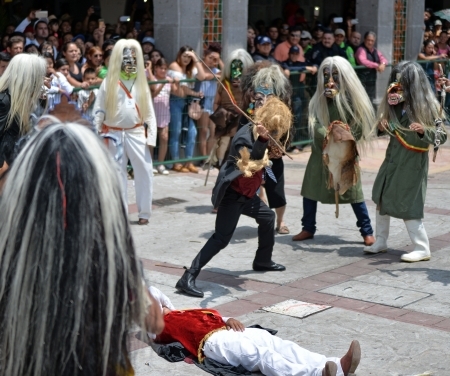 In the plaza mayor, several St. James’ battle the crowd of tastoanes. In the Cerro de la Reina (Queen’s Hill), a separate battle takes place. The number of tastoanes is so great that they must be organized by tastoanes mayores (senior tastoanes) so that they do not gang up and overwhelm St. James. In all venues, there are separate jugadas for small children, who do not strike each other nearly as forcefully as the adults and are closely supervised at all times. This gives them the opportunity to learn the tradition in a safe environment. A children’s jugada atop the Queen’s Hill. A female tastoan poses before battle. 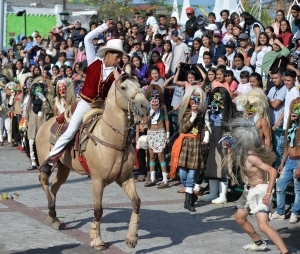 In the past, only males could participate as tastoanes, but recently, young women have begun to participate. Because the masks and clothes hide their identity, they endure the same whippings and demonstrate the same fortitude as their male counterparts. Although this post has focused on Tonalá, which holds the largest and most famous of tastoanes festivals, tastoanes are an important part of religious celebrations in other parts of Mexico as well. 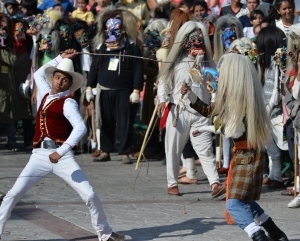 For example, the town of San Juan de Ocotlán (also in Jalisco) has a well known jugada, as do some villages in the state of Zacatecas. 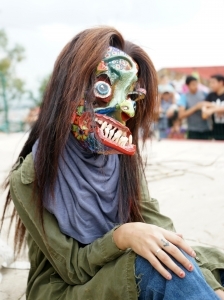 In each case, the mask looks somewhat different, and the sequence of events varies. But they share the theme of courageous indigenous resistance to Spanish oppression. The tastoanes, led by St. James on horseback and accompanied by three kings in clay masks, carry the image of St. James to the battlefield before the juego. Tastoanes display their physical prowess, trotting behind the image of St. James and grunting fiercely. 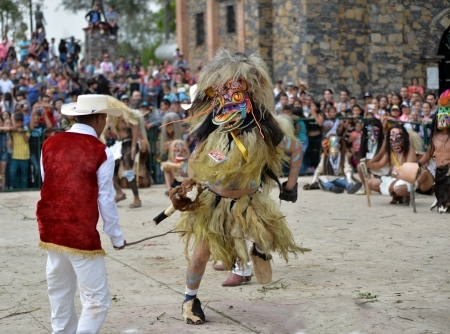 A traditional flute-player accompanies the juego. Tastoanes display their dexterity and strength before the battle. An unusually stylish tastoan with a mythical nahual adorning his nose. St. James is pulled from his horse and captured by the tastoanes early in the battle. St. James’ trusty dog drives off the tastoanes, rescuing St. James from a painful death. St. James revived by his sartorially punctilious dog. In another part of town (the Hill of the Queen), another tastoan faces off against St. James. 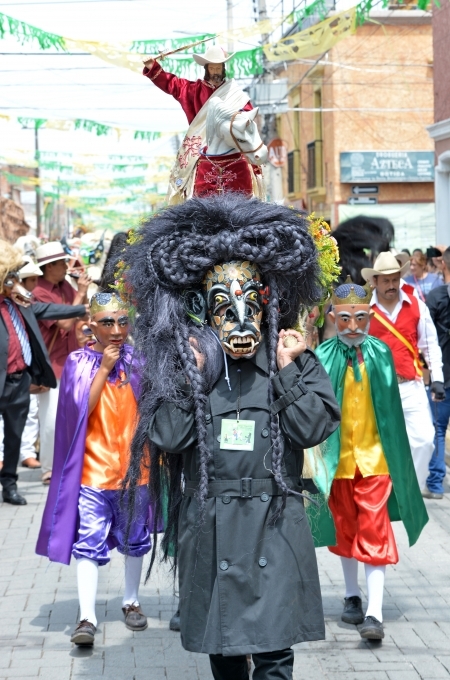 Jesús “Don Chuy” Delgado Navarro, a celebrated tastoan mayor and skilled mask maker, in costume and displaying an enormous scar from a past whip blow. 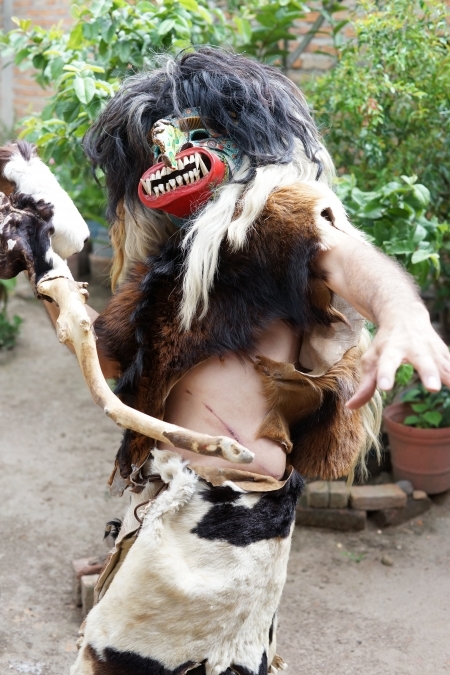 Click above for an original Second Face Museum video featuring the tastoanes of Tonalá, Jalisco.